This is a protein-fortified version of one of my favorite Asian snacks: the Chinese steamed bun filled with red bean paste. It uses vanilla gemma (pea) protein isolate (available at a very reasonable price from TrueProtein.com) to boost the protein content of this low-fat, satisfying post-workout snack. Gemma protein forms a fluffy, non-stick paste when mixed with water, and it has a natural bean-like flavor that is very similar to traditional sweetened Chinese red bean paste. Preparation takes around 4 hours, but you can mass produce several batches of these in one marathon session on a Sunday afternoon and freeze all of your extra buns for future use. They will keep in a sealed plastic bag for several months, and restore very well with re-steaming or microwaving in a damp paper towel for 1 minute per bun. The dough recipe can be safely doubled without adding any additional yeast, and also tastes great all by itself with no filling as a carb portion. You can also add savory fillings like BBQ pork, chicken, vegetables, etc. 1. Wash the beans, cover with cold water, and soak overnight. Drain beans and discard water. Place beans in a 1 1/2-quart saucepan, add 3 cups cold water, and bring to a boil over high heat. Cover, reduce heat to medium-low, and simmer 1 hour, or until very soft. Monitor the pan to make sure water doesn’t dry up. Drain and discard the water. 3. Divide bean mixture into 10 portions. 1. Mix together yeast, 1 teaspoon sugar, 1/4 cup flour, and 1/4 cup warm water. Allow to stand for 30 minutes. 2. Mix in 1/2 cup warm water, flour, salt, baking soda, 6 packets of Splenda (or 2 tablespoons sugar), and vegetable oil. Knead until dough surface is smooth and elastic. Roll over in a greased bowl, and let stand until triple in size, about 2 1/2 to 3 hours. 3. Punch down dough, and spread out on a floured board. Sprinkle baking powder evenly on surface, and knead for 5 minutes. Divide dough into 2 parts, and place the piece you are not working with in a covered bowl. Divide each half into 5 parts. Shape each part into a ball with smooth surface up and flatten into a round patty about 4.5″ in diameter and 1/2″ thick. 4. 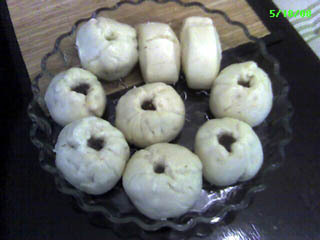 Spoon one portion of the bean mixture into the center of each dough circle, then bring up the edges of the dough to the top of the ball of bean paste and pinch them together, leaving a small 1/2″ hole to allow the steam to escape. Put each ball on a wax paper square. Let stand covered until double, about 30 minutes. 5. Bring water to a boil in steamer pot, and reduce heat to medium; the water should still be boiling. Place steam-plate or a dampened cheesecloth or broadcloth on the steamer section of the pot. Transfer as many buns on wax paper as will comfortably fit onto steam-plate leaving 1 to 2 inches between the buns. Cover steamer with lid. Steam buns over boiling water for 15 minutes. 6. REMOVE LID BEFORE you turn off heat, or else water will drip back onto bun surface and produce yellowish “blisters” on bun surfaces. Continue steaming batches of buns until all are cooked. I haven’t found a recipe for the buns before, so I appreciate very much! Thanks! This comment really doesn’t have anythign to do with this recipe (although I’m definitely gonig to try it!). I’ve been reading your blog for ages now and just decided to pipe up and let you know how totally inspiring you are to me. When I get into a funk and start to spin out of control, a little dose of Caustic Musings seems to get my head right again and keep me on course. You have no idea how huge that is. Thanks for sharing your experiences, perspectives, and resources here. I’m so grateful for you! Plus, I’m an idiot who regularly transposes characters in her typos. Ugh. Sorry. Hi Maggie – I just saw your eharmony commercial on TV! (Watching TiVo’d Hell’s Kitchen from last night). Cool! was JUST messing around with my pea protein in the kitchen…to a break to work (read: procrastinate) stumbled upon you and these recipes!! Any chance you’ll change your blog name to “Tasty Musings”? I don’t know why I always thought those things were made with rice flour.